Named Golfweek's Top 100 "America's Best Resort Courses"
Nestled among lakes, tall pines, oaks and palms, Grande Pines Golf Club peacefully coexists with the native flora and wetlands. The course is committed to environmental stewardship, and is a member of the Audubon Cooperative Sanctuary Program for Golf Courses. 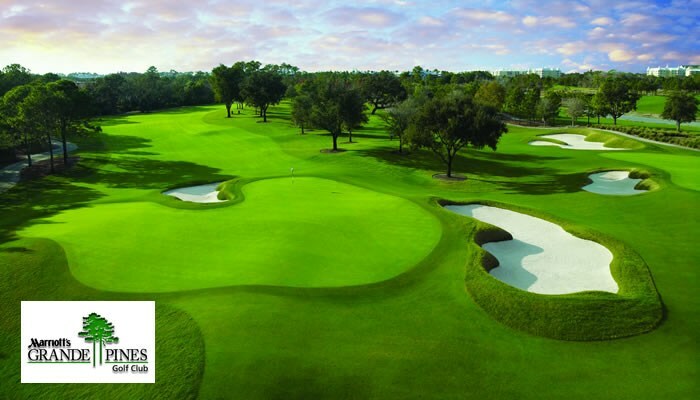 Renowned golf course architect Steve Smyers has designed one of Central Florida's most dynamic new golf courses. In partnership with six-time major champion Sir Nick Faldo, Smyers created each hole of Grande Pines Golf Club to be a strategic challenge that will bring out the best in each player's game. Each golf car at Grande Pines Golf Club is equipped with a ProLink yardage system to provide the golfer with accurate yardage to each hole. Embedded below is the Marriott Grande Pines Golf Club website for your convenience. Note: Frame is scrollable on both desktop and mobile devices.